Add flavor to beef, poultry, fruits and pastries. The Progressive 4-in-1 Flavor Injector features 3 different tips for injecting marinades, liquids, pastes and whole spices into foods. Injector is great for marinades, sauces, puddings, cream fillings, garlic cloves and large spices. 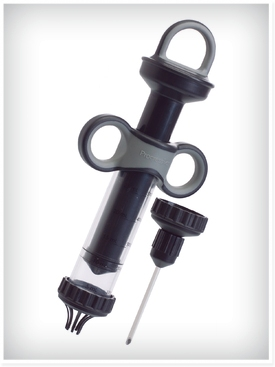 Flavor injector includes a comfortable grip for ease of use. Graduated markings up to 5 tsp or 25 ml make it easy to add just the right amount. All tips are removable and store inside the plunger of the Flavor Injector when not in use.